Nambozze Kansiime Madina commonly known as Hajat Madina is a member of the Revival band that is run by "Nabbi Omukazzi" and Pastor Yiga. 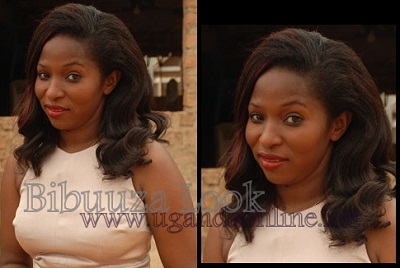 She is the voice behind the 'Bibuuza' song that has taken most Ugandan music lovers to another level. Bibuuza is threatening to be among the most played songs on Ugandan radio and TV stations due to the message contained in the song. Hajat Madina sings about the pain she feels after losing a loved one who moves in with someone else. This type of condition is common to many and the way she puts her story, gives the impression that the grass, windows, animals, and the 'Mazongoto' are all missing him making it a well coordinated piece and one of the reasons the song is becoming so popular. Hajat Madina was a backup vocalist in the Gagamel Entertainment before quitting. 'Njagale Ani' is another track by Hajat Madina. Meanwhile, On Eid-ul-Fitr day, Hajat Madina was in a helicopter with Maggie aka Nabbi Omukazzi distributing gift items at different locations in Kampala.